Here we go with Pedals And Effects Top Ten Pedals for 2015 and this year came with some radical sounds! As the boutique pedal dominance continues in the industry, a couple of the big guys managed to come up with some over the top pedals. I added a couple of reliable handy man tools, like the Hotone sampler, and the Keith McMillen MIDI controller but overall, wildness reigns king here at Pedals And Effects! DOD Meatbox / Gonkulator updated versions – Did you think I would leave the Meatbox off the list? Haha! Nope! This updated DOD Meatbox is better than the 90’s version for the simple fact that it is crazier than the original! Though I like the old pedal box better, the new Meatbox is true bypass, smaller and takes the industry standard A/C plug! The Gonkulator a tight updated version as well with a tunable ring mod! Hats off to Digitech / DOD for bringing the heat in 2015! Hexe reVOLVER II – This pedal should win for the most outrageous! The reVOLVER II is a pedal that I don’t actually own but is on loan from Jonathan Hischke. The reVOLVER II is a Micro Looper/Glitch/Stutter pedal that really chops your signal up in the most sci-fi sounding way. It gets that MPC snare hits crazier than on any hip hop or EDM record you’ve ever heard. Tweak people with the hard hitting reVOLVER! Red Panda Raster – The Raster is a digital delay with a pitch shifter integrated into the feedback loop. This feature allows you to achieve harmonized delays, reverse delays, chorus, arpeggios, infinite descents, chaotic self-oscillation and other walls of sound. Spend time with it and the results with give you the most cinematic sounds you can come up with! Shoegazers can’t live without the Raster! Earthquaker Devices Fuzz Master General – The Fuzz Master General is Earthquaker Devices take on the vintage Ace Tone Fuzz Master FM-2 Professional fuzz (an octave fuzz that was very similar to the Super Fuzz). The basic circuit was re-imagineered and basically updated. The “Voice” toggle allows you to enhance the fuzz capabilities while opening up variable tones out of the classic circuit. This toggle selects between germanium, silicon, and no diode clipping. The germanium diodes offer more output and a more gnarly fuzz tone while the silicon diodes compress the signal, giving you a tighter fuzz tone. When the voice is set to no diode clipping (center “ear drums blown” position) it is straight insane dirt grit with a slight ring mod sound! I fell in love with this pedal when I ran a drum machine through it (on Ben from Earthquaker Devices recommendation!) and it makes drum loops sound HARD! MXR Sub Machine – The Sub Machine Fuzz features the La Machine Fuzz’s circuitry and all of its functions—from its Volume, Tone, and Fuzz controls and octave up mode.—but it’s also got an old school sub octave circuit with its own level control, so you can dial in just the right mix of fuzz and sub octave signals. Also, the MXR team added a Series switch so you can run the sub octave signal straight into the fuzz—for some seriously heavy saturation — or alongside the fuzz for a split channel effect. 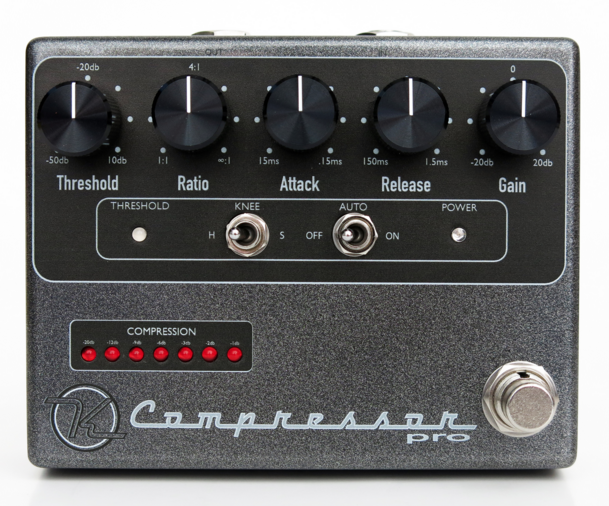 Keeley Compressor Pro – This is the only compressor that I have found that can wrangle in over the top sounds and keep them musically useful. You will get your jet sounding audio creations but the Keeley Compressor Pro will protect amplifiers and speakers from overload. Keeley hit it with this and he has many other great pedals in his line! Dr Acid Skate Fuzz – Met Tarn from Dr Acid Effects while on the Deltron 3030 tour. He hipped me to the hottest looking pedal in the market and it sounds killer! I have seen this fuzz done with the Black Sabbath font, as well as, with the Hot Wheels motif (good luck with the copyright on that, Tarn!) but the Skate Fuzz with the skate wheel as the stomp button is pure genius and easy to jump on! Either way, he makes awesome fuzzes, with fun designs. Malekko Scrutator – This pedal is the best designed bit reducing pedal yet! So many reasons but overall, the most synthesizer like bit reducer I have come across and here is why! The Scrutator is a bitcrusher in a sense but Malekko added the much needed preamp that drives the pedal into full effect and added a filter that is controllable by an expression or CVR device. This allows the musician to get real synth like envelopes and heavy crushing sweeps! Hotone Wally Looper – The Wally is a mini loop station which can record up to 15 minutes of loop phrases in one storable memory. It also has separate input/output level controls and a tempo variation/time stretch function. The tempo variation on the Wally Looper is a really fun effect to incorporate into your loops. You can get really musical loops happening at different tempos and you can take them up to an octave higher or octave lower, maintaining its key center. The other nice function is the input level. This is handy if you want to have, say, loud drums with a softer bassline or vice versa. Not all instruments have to come into your loop at the same volume. 12 Step’s keys can trigger individual notes, 5-note chords, clips, backing tracks, and give you control over parameters such as pitch bend and volume. With the ability to run stuff from your feet, 12 Step gives you the power to add more to your performance, even if both hands are being used to rip on guitar or bass. Tentacle (Earthquaker Devices) – Just on or off, no knobs. gritty octave up. simple and possibly weird depending on your vibe. Nard (Cameltone) – It’s ”Weezer’s blue album in a box,” as described by the dudes that made it. Pretty much right on. Distortion done right. Raster (Red Panda) – Really cool, really deep pitch shifting delay. Lots of options here. Sparkly delays of any interval and every note in between. or ring mod drones. Super Soda Meiser (Devi Ever) – I told Ben Hinz (Dwarfcraft/Devi Ever) that it’d be cool to have a soda meiser flipped on its side with a momentary button controlling the “chaos” switch. His response was, “cool, how bout a drone knob?” My response was, “cool, how bout i draw a weird guy holding a soda can?” thus the Super Soda Meiser was born. Gonkulator (DOD) – Tom Cram brought this 90s creature back to life. this time with a tune-able ring mod. so cool. Gunslinger (DOD) – Dial the gain to 12 o’clock and make any amp sing. Gets a nice transparent overdrive thing going on. Absolüte Würst (Keeley) – The release date was April 1st, so no one was sure if this was a joke or not (as was the point). I guess they call it a “random harmony generator.” Not sure if that’s accurate, but it’s really bizarre. The tagline is, “Much worse than the Klon!” so there ya go. Old Blood Noise / Black Fountain – Oil can delay. Very diverse, goes from subtle to really out there. Technically came out late 2014, but I just got mine last year and loved it. 12 Step (Keith Mcmillen) – Really great, portable, VERY durable MIDI controller. A little daunting to learn, but once you get the hang of it it becomes super user friendly. Hummingbird V3 / Earthquaker Devices – Though not new, this pedal was updated with an expression pedal out to control the rate which makes the best tremolo in the world that much better! Termo Fuzz / Shift Line – Too many fuzzes on this year’s list but this fuzz, made in Russia, was barely pushed out. This little dude rules and gets gnarly! Judder / MWFX – This is another glitch pedal that could have made it but I received a prototype and it still needed a couple of tweaks so I am still waiting on a completed version. This pedal glitches as well as the Hexe but it is different in many great ways. Hail all glitch pedals!